Every week we pull together some great Canadian recipes from Canadian food bloggers around the web featuring one main ingredient or dish. This week all our recipes will have visions of candy canes dancing in your head! These six candy cane recipes will give you some festive inspiration. Candy canes instantly make any baking recipe a festive Christmas baking recipe. Want to jazz up your amazing chocolate chip cookie recipe for the holidays? Add candy canes! Want to make your favourite brownies a little more festive? Sprinkle crushed candy canes on them. 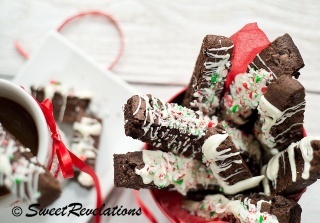 Candy canes make it so easy to turn the every day into a Christmas treat! Here's 6 ways to bake with candy canes that will have you thinking candy cane crush in no time! These all look amazing! Thanks for sharing my recipe! !